I think most parents would like a dream bedroom. My bedroom hasn't got much storage, and mostly got most of my children's things in it! I would love to do my bedroom from scratch and do it exactly how i want! Well, i am entering a competition (here) where i might win £500 to spend in Debenhams. I have always dreamed for a clean, fresh bedroom. I like a room being quite empty but quite welcoming too! I've always liked fresh clean colours such as white and i have always loved Oak so this kind of bedroom would be my dream bedroom. 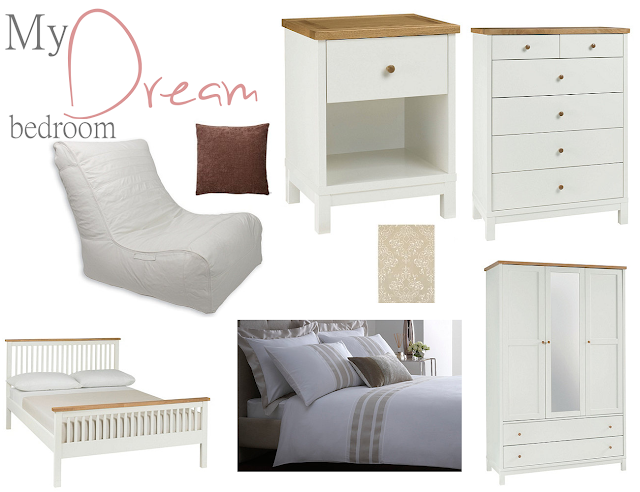 We had to do a Mood board with things we would buy from Debenhams to make our 'Dream Bedroom' and spend up to £5000, everything i chose i would have spent £1728.00. I don't think i could actually spend no where near £5000 in a bedroom. I like things matching and then something unique in the bedroom that gives it a little twist, and that is why i chose the 'Fawn Harlequin Milano Rug' i thought the pattern on the rug is lovely! And it just gives the room a more welcoming feeling. The judges of this competition are ; LoveChicLiving and Mammasaurus .